Rinse clean chicken, slice thinly. Rinse chilli and slice on bias. Wash spring onions, cut into small pieces. Peel onion, slice thinly. Fry dry chillies until fragrant and cutt into 1-2 cm. leave in the small bowl. Heat cooking oil in wok. Stir fry garlic until fragrant. Add chicken, cashew nuts, chilli and onion. Stir fry. Season with light soy sauce, oyster sauce, and salt. Stir fry to mix well. 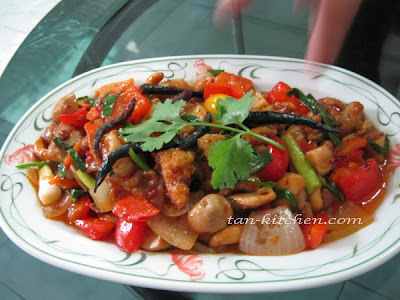 Transfer to a serving dish with fried cutt chillies on top.